Simply connect this award winning device to your vacuum cleaner and enjoy dust free scraping! 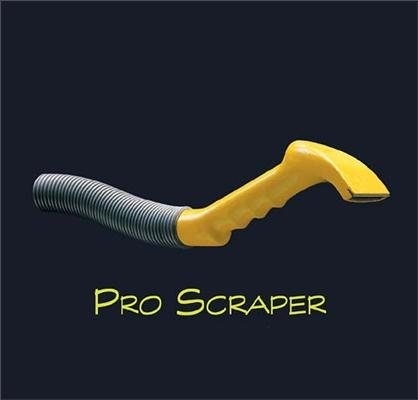 The Pro Scraper is aimed at the top end of the market and customers appreciate the quality and benefits of the design. A unique facility for connection to a vacuum cleaner for dust free scraping. A unique ergonomic design. A top quality tungsten carbide blade. A heat resistant engineering nylon construction. Many GelPlane customers have asked whether our gelcoat peeler is suitable for removing only the anti fouling/bottom paint. Although it will do the job, as the paint thickness varies, inevitably some underlying gelcoat will be damaged and it is perhaps too expensive to be viable for this application. It was these enquiries that prompted us to design the ProScraper. The worst part of removing anti fouling is the mess that is made and the risk to the individual of breathing in the toxic dust. The control of this dust was therefore given priority in the design. The first attempts were crude, however, with the help of computer aided design, prototyping with stereo lithography and extensive testing the shape was refined. The resulting form is aesthetic, comfortable and extremely effective for removing anti fouling with no airborne dust. The hollow scraper is manufactured from heat resistant engineering nylon. This quality tool is therefore durable and with a tungsten carbide blade. The ProScraper is designed to fit on to a standard 32mm vacuum hose and is provided with a rubber connector for when a male to male coupling is required. Had to scrap off 12 years of antifouling on my pro charter 32 boat and found this scrapper to be fantastic product. When connected to a hoover for dust extraction it make the air very clean around the boat which is a great health factor and good long lasting tunsten blade that is reverseable. 5/5 from me on this product.